Why organic? Produce that is organic means it is from the origin of that plant life. In other words, the seed has not been altered and is grown in mineral rich soil and with out chemical pesticides. Carrots are high in beta- carotene, raisins are high in pottasium, iron and vitamin B-6. I can go on and on about all the nutrition this salad offers but the real benefit is how much your family and guest will enjoy quenching their palates with this colorful salad. Cut the carrots in half and place in the feed tube so they are lying on their sides. Process in batches. Place the grated carrots in a medium bowl, add the lemon juice and toss. For the dressing, whisk together the Greek yogurt, mayonnaise, agave nectar, and salt. 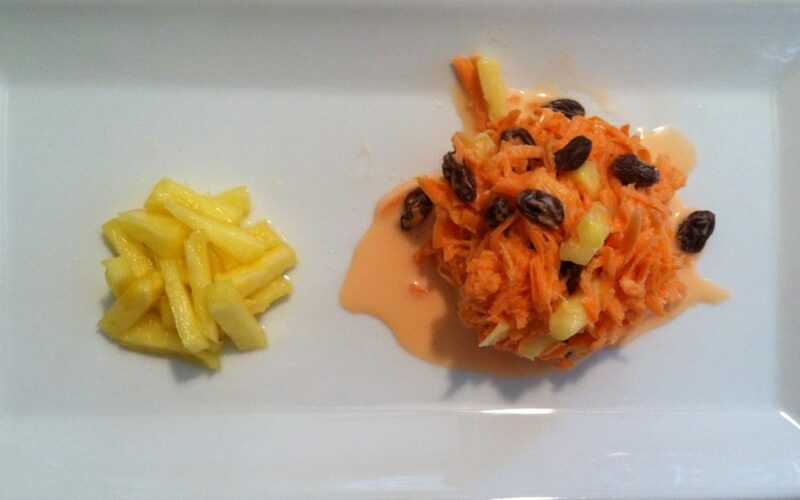 Pour the dressing over the carrots and add the pineapple and raisins.